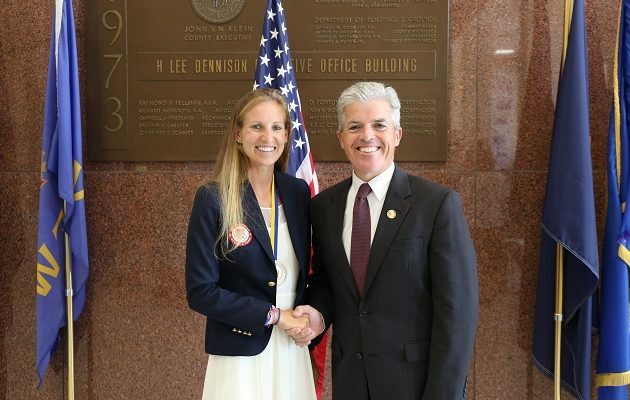 SUFFOLK COUNTY, NY – Suffolk County Executive Steve Bellone honored Farmingville resident, Sachem High School graduate and now two-time Olympian Maria Michta-Coffey last week for her athletic, academic and community outreach achievements. The County Executive presented Michta-Coffey with the Suffolk County Distinguished Service Medal – making her only the 21st person to receive the distinction since 1973. The award is the county’s highest honor bestowed on an individual for extraordinary service and dedication to the people of Suffolk County. Maria Michta-Coffey will compete in the Women’s 20 Kilometer (km) Race Walk event at the 2016 Summer Olympics in Rio next month. 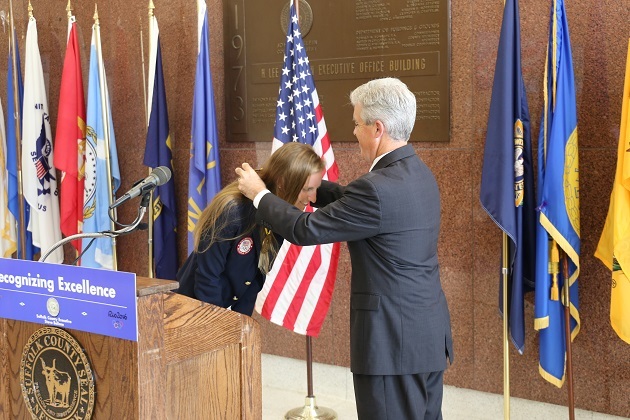 Michta-Coffey competed in the 2012 Summer Olympics in London, and placed first at the U.S Olympic Team Trials last month. She is a five-time outdoor national champion. 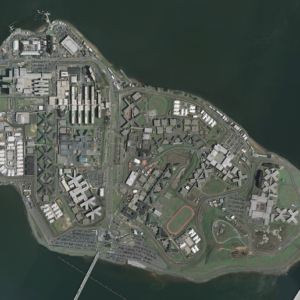 Michta-Coffey graduated from Sachem High School in 2004 and graduated as valedictorian at Long Island University C.W. Post in 2008. Michta-Coffey additionally earned her Ph.D. in Biomedical Sciences at the Mount Sinai School of Medicine in 2014 while training for the national championships and this year’s games. Michta-Coffey additionally serves as a volunteer coach for the Sachem School Track and Field program and provides academic assistance to young student-athletes. She is also an adjunct instructor of biology at Suffolk County Community College. 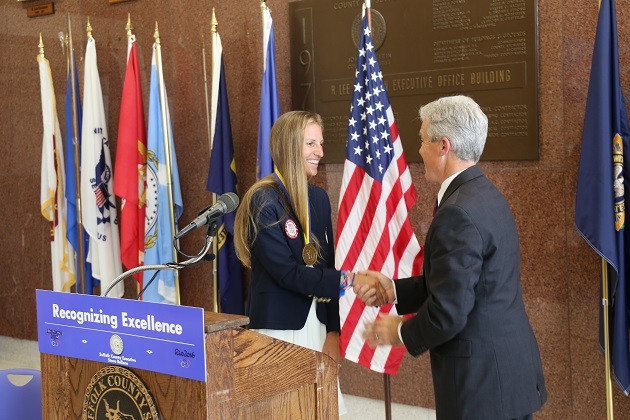 “Thank you to County Executive Bellone for making this day possible for Maria and for the Long Island athletic community,” said Gary Westerfield, Executive Board Member of USA Track & Field Long Island and Michta-Coffey’s long-time coach. “Dr. Maria Michta-Coffey is a humble leader to our local athletes. While she has received many awards as the best walker on Long Island in the USA, she has used these honors to motivate and instill the same drive that makes her an Olympian into the young people that she works with — both as a motivational speaker and a coach. Maria Michta-Coffey will be joined by three exceptional athletes with Long Island roots who will represent the United States in the 2016 Summer Olympic Games in Rio, including Northport native Allie Long, Rockville Center native Crystal Dunn and Syosset native Sue Bird. Long Island will also be well represented in the 2016 Summer Paralympics in Rio later this year, including Tysheem Griffin of Amityville, Billy Lister of Cold Spring Harbor, Michael Brannigan of East Northport, Dorian Weber of Manhasset, Jaclyn Smith of Williston Park, and Steve Serio of Westbury. For more information on the Suffolk County Distinguished Service Medal and the ceremony honoring Maria Michta-Coffey, log on to www.suffolkcountyny.gov or www.facebook.com/stevebellone. 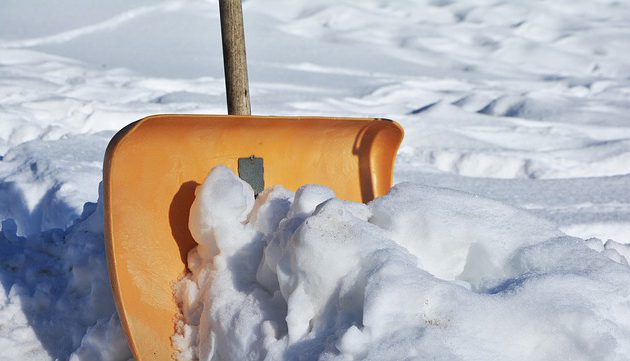 Photos Provided by The Office of Suffolk County Executive Steve Bellone. Press Release by Vanessa Baird-Streeter. Press Release Made Available by The Office of Suffolk County Executive Steve Bellone.